Managing director of Biological Therapies. Dr Dettman has been a pioneer in nutritional medical manufacture and research for over 40 years. * PhD in Biochemistry (Monash University). * Vice Chairman of World Federation of Chinese Medicine Societies -Specialty Committee of Natural Therapy. Vitamin C, Nature's Miraculous Healing Missile. Co-Author with Dr Glen Dettman and Dr Archie Kalokerinos. Initially, Ian studied the first two years of the Pharmacy course at the Victorian College of Pharmacy before completing tertiary qualifications in Biochemistry, Microbiology and Genetics at RMIT. Ian then became interested in medical research and completed a BSc (Hon.) degree, followed by a Doctorate (into the Biochemistry of connective tissue, especially proteoglycans and collagen) at Monash University. This study involved research into arthritis and ageing. He then joined his father, Dr Glen Dettman, at their family business, Oakleigh Pathology Service. Over the course of fifteen years he gained extensive hands-on experience in biochemistry, microbiology and haematology. In the latter years, Ian managed the pathology and helped it gain NATA accreditation. Ian became a Registered Pathology Practitioner. During the course of this 15 years (1973-1988), Ian became involved in Vitamin C research with Dr Glen Dettman and Dr Archie Kalokerinos. This research continues to this day. He personally developed patents concerning the manufacture of Vitamin C and extended his knowledge of nutrition, diet and lifestyle by becoming qualified as a Natural Therapist, in which he has continued to practise for the last 20 years. Ian also became a governor of the prestigious Southern School of Natural Therapies, where he sat on numerous committee meetings concerned with course content and natural therapies registration. Ian has lectured to Doctors, tutored in Biochemistry to medical students at Monash University, and lectured to students at the Southern School of Natural Therapies. He has co-authored numerous papers as well as the book Vitamin C - Nature’s Miraculous Healing Missile with his father Dr Glen Dettman, and Dr Archie Kalokerinos. 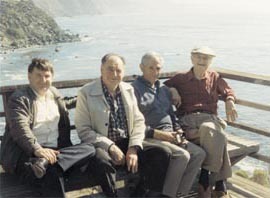 Ian was privileged and honoured to meet Professor Linus Pauling (the only person to have won two unshared Nobel prizes) at his home in Big Sur, California in November 1993. Ian and Glen received a grant from the Linus Pauling Institute for a research project to test Vitamin C levels on newborn babies delivered at a Community Hospital. Results were published in The Australian Nurses Journal. In 1988, Ian sold the pathology service and started a pharmaceutical manufacturing business called Biological Therapies, which specializes in producing numerous injectable vitamins, including Vitamin C and a range of B Vitamins. The manufacture of injectables is at the top end of the pharmaceutical market place, and with Ian as Managing Director, Biological Therapies has gained its sterile manufacturing license from the TGA (Therapeutic Goods Administration). Biological Therapies is also licensed for and manufactures herbal tinctures, powdered vitamin and mineral mixes, emulsions and capsules. Dr Dettman is the Founding Director of the Australasian Institute of Medical Nutrition www.aimnutrition.org which tutors Doctors in the theory and practice of injectable nutrition.